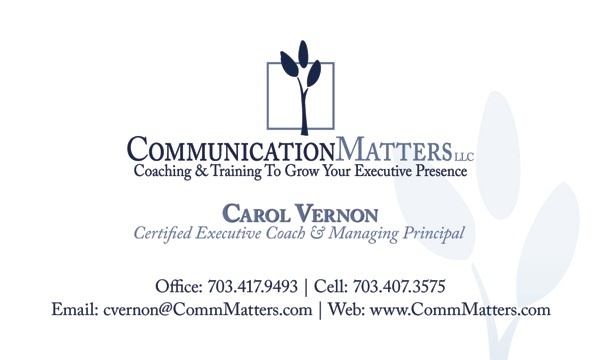 At Communication Matters, our sole focus is on improving individual and organizational effectiveness. We specialize in helping leaders and teams develop the soft skills of interpersonal communications; knowledge about leadership presence; and clarity about strengths they need to prosper in the increasingly demanding work world. We offer executive coaching, training, and meeting facilitation services. We use proven, results–oriented solutions to help individuals and teams. We have worked successfully with many national and international private-sector, non-profit, and federal executives and teams. Our coaching, training, and facilitation has helped our clients produce remarkable results. As a Washington, DC-based, women-owned business, our principal and associates have completed rigorous training programs, hold credentials from the International Coach Federation (ICF), and bring to their work a wealth of comprehensive corporate, non-profit, and government leadership experience. As a boutique firm of highly skilled professionals, we are able to guarantee our clients a “what you see is what you get” service promise. Via our network of local and nationwide alliances with the very best associates, Communication Matters can put together the team that best meets our client’s current needs.